By now, you've no doubt heard of the so-called "death ray" in Las Vegas, caused by the curved surface of the newly constructed Vdara Hotel. The hotel's facade acts as a parabolic reflector, concentrating solar heat into a specific target area—enough to melt plastic drinking cups and even burn people's hair. It's the future of urban thermal warfare, perhaps: hotels armed against other hotels in a robust defense posture defined by pure heat. Of course, Frank Gehry's Disney Concert Hall here in Los Angeles had its own "microclimatic impact," as this PDF makes clear. Back in 2004, USA Today explained that "the glare off the shimmering stainless steel curves at the Frank Gehry-designed Walt Disney Concert Hall is so bad, it's heating up nearby condos at least 15 degrees and forcing owners to crank up their air conditioners." [Image: By Sean Lally, Andrew Corrigan, and Paul Kweton of WEATHERS]. Oddly, though, this same heat-reflection effect came up recently in a course I'm currently teaching; a student and I were looking at a project by Sean Lally, Andrew Corrigan, and Paul Kweton of WEATHERS (previously documented on BLDGBLOG here). 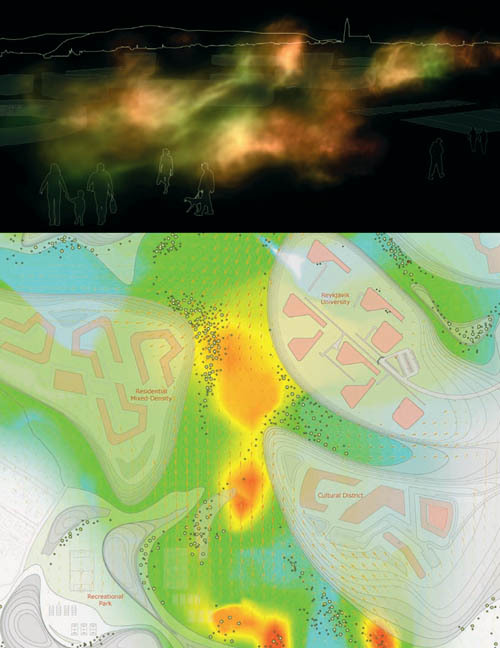 That project proposed not really building anything at all but simply tapping the geothermal energy available beneath the Icelandic capital of Reykjavik to create "microclimates" around the city. "Heat is taken directly from the ground," they explain, "and piped up across the landscape into a system of [pipes and] towers." However, the question here would be: could you deliberately design an architecture without walls, using only thermal gradients—defining areas of public use and congregation solely based on heat? Could these and other parabolic reflections of solar energy be deliberately used as a tactic of architectural intervention and urban design? CTC™: Controlled Thermal Concentration. Minneapolis-St. Paul, for instance, gets a series of strange pavilion-like stands topped with polished reflectors—and they're ugly as hell, and they make no sense at all except as bad public art, until you stand right next to them. All the snow around them has melted, you first notice, and you can actually stand there without a jacket on even in the depths of winter. Also aren't they supposed to go over building plans carefully to make sure something like oh say a deadly sun ray wont result? Yves Klein's 'Air Architecture' first springs to my mind, after Scofidio of course. all this makes me think of philippe rahm's experiments, something one could call atmospheric architecture (or, if you don't like it, you could call it not architecture at all). have to say I love the idea of a hotel that works AGAINST its guests. I recall another tale of hotel warfare, Geoff. When I was in Miami for Basel last year I learned about how the Fontainebleu Hotel and the Eden Roc next door were in such cutthroat competition that one (and here I can't recall which) built a towering wall whose sole function was to plunge the other's pool in shadow each afternoon. Defining, or rather, ruining, architectural space through thermal design indeed. A few of my colleagues and I are currently tackling the question that you posed regarding the use of material energies as instruments in architectural design. We are engaged in a year long research / projection studio with Sean Lally of WEATHERS at UIC SoA. Perhaps our work will be publishable answers to your queries by the end of the year. "Also aren't they supposed to go over building plans carefully to make sure something like oh say a deadly sun ray wont result?" If you had read the articles concerning this you will see that nobody had been killed due to this and that it is a common situation where glass buildings are concened. The worse thing that has happened is that somebody forgot to move and got his hair synged. Really? I remember a couple years ago hearing about a town in Austria that has mountains to the south that completely block out the sun during some winter months, so they erected large mirrors that focus some sunlight into the town square, allowing people to get some sunlight during the winter. Last week I stayed at the Sheraton Mahwah in New Jersey, a truly sinister, Ballardian bit of corporate architecture. Similar to that apocryphal story about the smoking area at Thule: a slightly warmer spot in front of a radar array. On a much smaller scale, a similar effect occurred in a recent temple just outside Kyoto, Japan. As can be seen here the design of the Glass Temple by Takashi Yamaguchi is mainly underground, with a glass roof projecting slightly above the gravel landscape. On a 2004 visit we noticed a corner of the glass roof was covered with bamboo. It was explained to us that the sun's reflection off of the glass roof caused an adjacent tree to die. Further a branch from the tree fell and broke the glass, so the bamboo cover was to cut down on the glare and cover the hole created by the tree.